Average auto insurance rates in California for 2019 are $1,602 a year for full coverage insurance. Comprehensive insurance, collision, and liability insurance cost approximately $356, $652, and $414, respectively. Los Angeles and Glendale have more expensive car insurance rates, and the three most popular companies in California are State Farm, Farmers Insurance, and Allstate. For an average driver, California insurance prices go from as cheap as $492 for basic liability insurance to the much higher price of $3,460 for a driver required to buy high-risk insurance. These price ranges illustrate why everyone should compare prices using their specific location and their own personal driving habits, rather than relying on average rates. Enter your California zip code below to view companies that have cheap auto insurance rates. The chart estimates California car insurance prices for different situations. The lowest price with discounts is $920. California drivers who use higher $1,000 deductibles will pay about $1,372. The average price for a middle-aged driver with a clean driving record using $500 deductibles is $1,602. Selecting more expensive $100 deductibles for physical damage coverage could cost up to $2,046. Drivers with multiple violations and accidents could be charged at least $3,460. The rate for full coverage for a teenager can be as high as $5,896. Car insurance rates in California are also quite variable based on the make and model of your vehicle, your risk profile, and physical damage deductibles and liability limits. The area you live in has a huge impact on auto insurance rates. Less congested rural areas could see prices as low as $1,200 a year, whereas some neighorhoods in Los Angeles and Glendale may see rates upwards of $2,600. Even different neighborhoods within a few miles of each other in the same city can have significantly different rates. These geographic rate differences emphasize the importance of getting rates for your specific zip code. Your choice of vehicle is a large factor when calculating the price of car insurance in California. Driving a cheaper and lower-performance vehicle will save money on insurance primarily due to lower repair costs and reduced frequency of accidents. The next table shows insurance cost estimates for the most popular vehicles in California. Your auto insurance company definitely affects the cost of coverage. Every insurance company has a slightly different rate calculation, and prices have large differences based upon different risk factors. In California, car insurance prices range from $1,132 with USAA to as high as $2,526 with Auto Club. Companies like Wawanesa, Century National, and CSAA fall somewhere in between. These are probably not the exact rates you would pay, as your vehicle make and model, your driving history, and your location in California have to be factored in. Since prices can be so different, the only way to figure out which car insurance is cheapest is to regularly compare prices from as many companies as possible. Each insurance company uses a different method to calculate prices, so rate quotes may be quite different between companies. Who Has the Cheapest Insurance Quotes for a Ford Fusion in California? How Much is Car Insurance for Good Drivers in California? 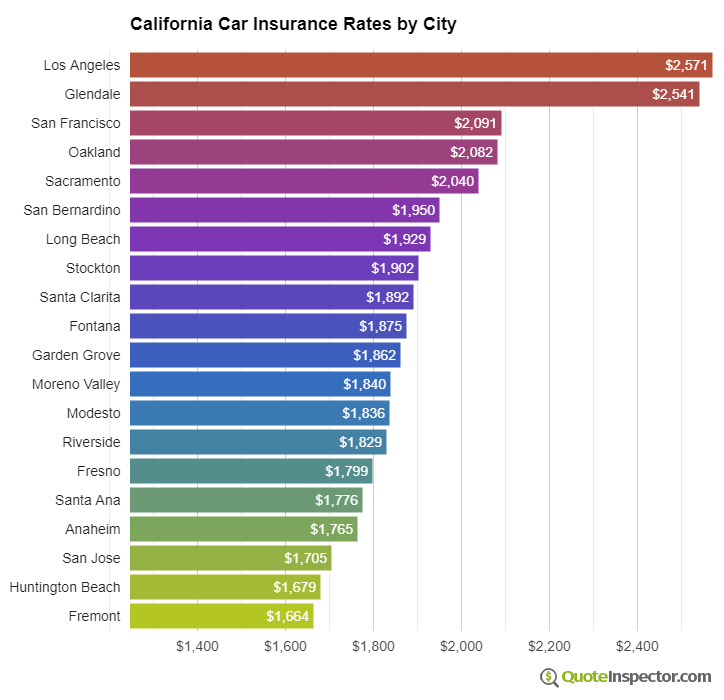 Read about how to save money on auto insurance in some of the larger cities in California below.